Plastic covers or shrouds protect the electronics and battery of the wheelchair. Always keep protective plastic covers (“shrouds”) in place. 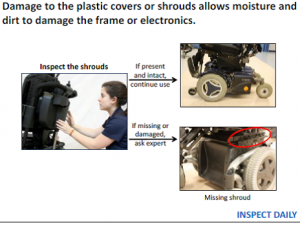 If the shrouds are damaged, dirt and moisture can impact the proper function of the wheelchair. Inspect that the shrouds are present and intact. Jiggle the shrouds to inspect they are not loose. If shrouds become damaged, they should be replaced. If you find problems, contact a wheelchair maintenance expert immediately. Inspecting the shrouds should be performed every day. Turn the wheelchair off (recommended). This is the only way to check if it brakes immediately. The motors are the heart of any power wheelchair. They convert the electrical energy of the batteries to mechanical work. In many cases one motor is used to drive each wheel. Listen to your motor. It is a good idea to become familiar with the healthy sound of your wheelchair when it is new. Over time, just like a car, it will become a little noisier, but if your ear is tuned to how it sounds when it is healthy, you will be able to notice when there is excessive noise. Increased noise might indicate worn bearings, out of line belts or gears, or frame problems. If the wheelchair has two motors, each should sound the same. 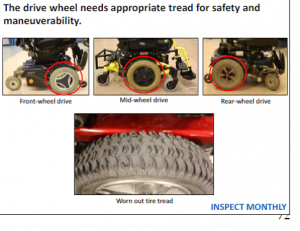 Motor failure can leave the wheelchair user stranded. If any unfamiliar or unrecognized noises are heard, contact a wheelchair maintenance expert. 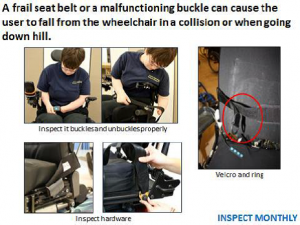 Inspect that the wheelchair cannot manually move when the lever is engaged and it can be moved when it is disengaged. There are different types of motor disengage lever. 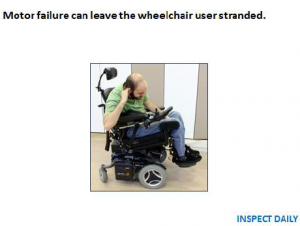 Motor lever failure can leave the wheelchair user stranded as well as injured. This task should be performed daily. 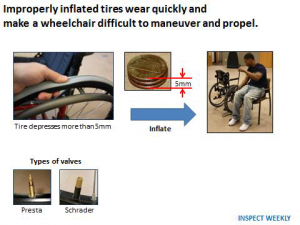 For pneumatic (inflatable) tires if the tire lacks sufficient pressure, the wheelchair will be difficult to maneuver and less stable. The tire and wheel will also wear much more quickly. check the tire pressure by pressing down firmly on the tire with your thumb. If the tire is able to be pressed down more than 5mm (roughly the thickness of three pennies stacked together), add air with an air pump. A bicycle pump or pneumatic air pump can be used to inflate wheelchair tires. This task should be performed weekly. Nuts and bolts that are too loose will loosen further or not hold the part properly. 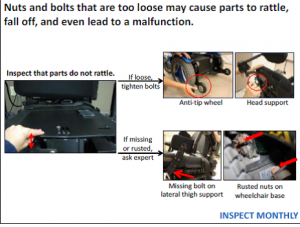 Visually identify loose bolts. Move parts and check that they do not rattle. Depending on the bolt, you can use a screwdriver, wrench or Allen wrench. Tighten to the point where the parts that the nuts and bolts are holding do not move at all. Do not over tighten! Some bolts are not to be tightened all the way, such as lock nuts. Over tightening a loose nut or bolt could damage the part and/or bolt. Bolts are graded for strength and hardness. The specific grade is selected by the manufacturer for the part where the bolt is to be used. Bolts used on wheelchairs must be replaced with the proper size and type bolt. If nuts or bolts are missing, stripped or broken, contact a wheelchair maintenance expert to get the bolts/nuts replaced. Inspect the frame and weld points and confirm that they are intact. Check the weld points, holes, and bends. 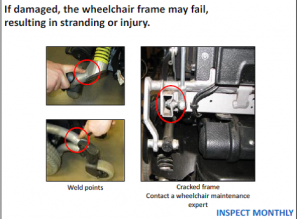 Look for cracks and fractures as they can result in catastrophic failure of the wheelchair. This could lead to injury and being stranded. Inspection of the frame should be performed monthly. The wheels have a profound effect on the performance of the wheelchair. Drive tires can be pneumatic tires or solid. Check for wear on the drive tires. When tread depth is low it can easily lead to power chair slippage, making braking distances longer. Wear can also negatively impact the maneuverability and stability of the wheelchair. Therefore replace the tires as early as possible when they are found to have insufficient tread depth. Contact a wheelchair maintenance expert to do so. This inspection should be performed monthly. 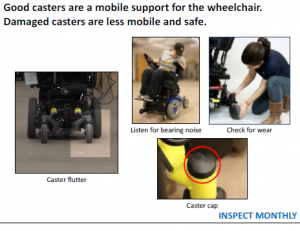 The casters have an important effect on the performance of the wheelchair. Check for wear, cracks, and bulges on the caster wheels. 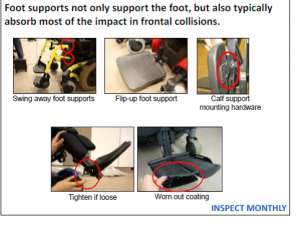 Wear can negatively impact the maneuverability and stability of the wheelchair. Caster stem housing should be aligned vertically. 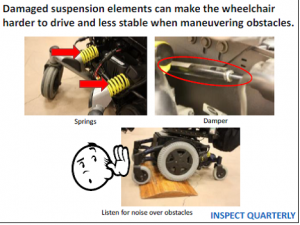 Check while driving the wheelchair for wobbling of caster wheel and looseness. Check for caster flutter. Fluttering is the term used to describe the shimmy or rapid vibration of the caster wheels. Excessive flutter can cause the wheelchair to move in an unwanted direction. This might cause a collision and injure the user. Contact a wheelchair maintenance expert to get repaired. Bearings will wear out on a caster wheel during normal use. Problems in the bearings are identified when noises like clicking or grinding are present. They need to be replaced before they fail. Caster wheels wear out faster than the drive tires. This task should be performed monthly. 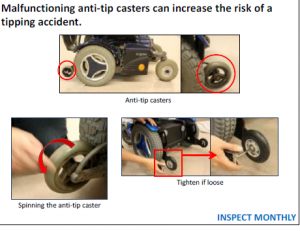 Anti-tip wheels may be located in the front or rear of the wheelchair. When they are in use and properly adjusted, if the wheelchair begins to tip over it is caught by the anti-tip casters. Therefore, they can help to prevent some tipping accidents. Check that the anti-tip wheels are not loose and do not squeak or drag. If wheels are loose, tighten any screws until snug using an Allen wrench, open end box end wrench. Inspect that there are no cracks or the wheels are not wore out. If problems are identified, contact wheelchair maintenance expert to get the anti-tip replaced. Cushions are a very important component of the wheelchair and do not last as long as the frame. The interaction between the cushion and the body determines the user’s comfort, function, and clinical safety. Deterioration in the cushion can increase the risk of developing a pressure ulcer. 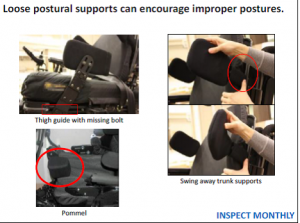 Users may require head and neck supports to provide the necessary stability required to control a power wheelchair and to prevent the head from extending beyond the plane of the back support. This is especially important if the seating system is tilted or reclined. There are many types of head supports including: flat, flip-down, removable, curved, winged, vertical wedge, U-shaped, lateral, among others. Head supports are mounted to the seating system using adjustable hardware so that the support can be moved, adjusted, and removed as needed. Check that the head support is properly tightened and intact. If the head support is designed to move, it should move freely, but not be too loose that it rattles. 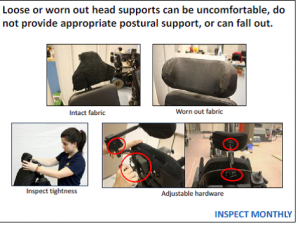 Loose and/or worn out head supports can be uncomfortable, do not provide appropriate postural support, or can fall out. Tighten loose bolts using an Allen wrench, open end box end wrench. Lubrication may be necessary in hinges/movable parts if the supports do not adjust easily. If problems are identified contact the wheelchair maintenance expert. Foot supports are used to support the feet and legs. There are different foot supports that can flip up or down, swivel, elevate, or can be removed. Often the foot supports are the first part of the wheelchair to come in contact with an obstacle. They are used to open doors, act as bumpers, and also scraped along the ground when the wheelchair is loaded into a motor vehicle. Swing-away foot supports are not as durable as rigid foot support. It is common that swing away foot support bend upon impact. Inspect the swing away foot supports, look for wear in the pins, bolts and bushings. Inspect that the foot supports are intact, are tightened and can be released (if originally designed to do so), put back into place with ease and latch easily. You can use a screwdriver or wrench or Allen wrench to tighten loose bolts. If problems are identified, contact the manufacturer. Proper seating can improve a person’s stamina and provide greater comfort. Supports are used to align and hold a person in a manner that improves seated posture and alignment while maintaining or improving function. These include: abductor pommels, hip adductors, leg abductors, leg adductors, and lateral trunk supports. If the supports are swing-away or flip-up, inspect that they move freely, but are not too loose to rattle. If they are fixed, inspect that they are tightened. Loose nuts and bolts can eventually work themselves all the way out, and could cause the support to fall off. However, over tightening a loose nut or bolt could damage the housing and/or break the bolt. Tighten loose bolts using an Allen wrench, open end box end wrench. After tightening be aware of red spots on the skin that is in contact with the support. If red spots are found, loosen the support and contact the wheelchair maintenance expert. Inspect that the fabric and cushioning of the support are intact. Hard supports may be uncomfortable and increase pressure to the skin that they are in contact with. This can increase the risk of pressure sores. Pelvic support and positioning can be achieved using a pelvic belt or lap belt, which can prevent or correct a slouching posture and prevent the person from sliding forward on the seat. Check that the buckle latches and the hardware that attaches the strap to the frame are undamaged. Inspect the strap and velcro (when applicable) for any signs of wear. The strap, buckle, and hardware should all be in good condition. The latch on the belt should not slip or become unlatched inadvertently. Contact a wheelchair maintenance expert if problems are identified. Power seat functions are options that benefit people who are unable to move or reposition themselves effectively independently. These options redistribute pressure, manage posture and tone, provide comfort, and help with personal care activities. When inspecting that the power seat functions first tilt, then recline and finally elevate the legs. Inspect that the full range of controls, indicators, driving, and horn are working smoothly and consistently. If the power seat function(s) malfunctions, the user can be left in an unsafe position for driving or at risk of pressure sores. Contact a wheelchair maintenance expert if you identify problems such a grinding noises, jerking, or not working consistently. Batteries are the fuel system for power wheelchairs. If the batteries do not work properly, the wheelchair will not work properly. Maintaining the batteries is vital to the performance of the wheelchair. It is important that the appropriate charger be used with each battery set. Only use the charger that came with the wheelchair. Inspect the battery charger cable. If problems are found contact a wheelchair maintenance expert. Joysticks are the most common control interface between the user and the wheelchair. Joysticks and switches can be used to effectively control a power wheelchair. 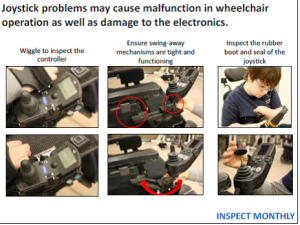 Joystick problems may cause malfunction in wheelchair operation as well as damage to the electronics. Check the joystick and rubber boot around the base of the joystick for damage. Check that the joystick returns freely to neutral without binding. Check that the seal on the joystick is intact; it keeps dirt and water out. Check that all switches and controls are tightly in place. Check that the controller clamp holds the joystick firmly in place. If found loose, tighten appropriately. Contact a wheelchair maintenance expert immediately if problems are identified. 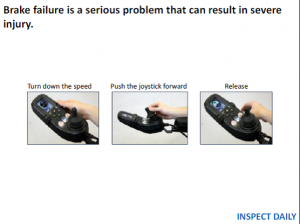 Note: to avoid excessive moisture in the controller: Always carry a gallon plastic bag to cover the joystick and controller if it rains, to prevent moisture accumulation. If the joystick/controller gets wet, use a hair dryer to blow through the charge/controller plug. Wires and connectors are part of the wheelchair’s electrical system. Check all electrical connections to ensure they are firmly in place and free of grime and corrosion. Connectors can loosen with bumps and vibration. Inspect that they are firmly connected. Corrosion can render connectors useless, resulting in motors that will not drive or batteries that will not charge. Inspect that all cables and wires are intact. Check wires to make sure they are safely away from all moving parts such as belts, gears, and wheels, with no chance of being caught or tangled. It may be necessary to tie cables down to the frame or in a bunch. Use cable ties for this purpose. If the wheelchair has power seat functions, ensure that cable ties do not restrict the seat positioning. Wires that become caught in moving parts can become disconnected or even snap. Inspect that wires and cables are intact and not frail. Dampers or shock absorber springs are used to improve ride comfort, reduce driving fatigue, and accommodate rough terrain. Inspect springs looking for cracks on the paint. Inspect that the dampers are not leaking fluid. Be aware that when you are going over obstacles, for example a speed bump, the wheelchair does not make noises and it is safe (at least 3 wheels must be in contact with the ground all the time). If problems are identified contact your wheelchair maintenance expert. If you have had significant changes in weight this may mean that the suspension is not providing the same damping. Contact a wheelchair maintenance expert if you had significant changes in weight. Inspect the suspension every 3 months. Batteries are the fuel system for power wheelchairs. If the batteries do not work properly, the wheelchair will not work properly. Maintaining the batteries is vital to the performance of the wheelchair. Batteries last longer if they are never run completely flat. However, charging too frequently when the batteries have only been used a little will also decrease the batteries’ life. Only the charger provided with the wheelchair should be used. Batteries should be stored fully charged. A well-maintained battery should last from 1 to 1.5 years. If the batteries are having difficulty keeping a charge, contact a wheelchair maintenance expert. Batteries must be installed and maintained by a wheelchair maintenance expert. If the power seat functions malfunction the user can be left in an unsafe position for driving or at risk of pressure sores. Excessive dirt build-up can make the tracks wear over time and may stop working. Clean the power seat functions and all the tracks (including tilt, recline, leg support elevator, and seat elevator) with a dry soft cloth. The seat should be at the maximum range. CAUTION: If there is grease/lubricant on the track do not clean it. ↑ 2.0 2.1 2.2 2.3 May, R. M. (2017). 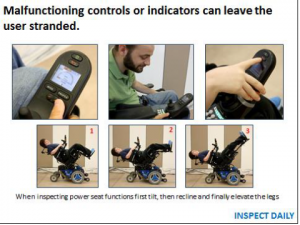 Wheelchair Maintenance Training program ( WMTP ) Clinician ’ s Reference Manual.